From 2000 onwards, We have computers and desktop that runs web and desktop applications. A few years back, mobiles and tablets came into existences and popular still continues. The industry started developing mobile apps that run on these devices. overall programmers write a software code for web, desktop and mobile applications. With recent advancements in technology. a lot of devices came into existence. different devices are sensors in cars/motors/home and electronic devices. Internet of things is a concept where these group of devices connected to the internet to exchange the data. We have to write a program/embed a code on this hardware devices to share data across cloud and DB servers. A lot of Devices types introduced and a lot of data. there are many things to dealing with devices. 1. An electric motor can be controlled using Android devices to start/stop. From all these devices, a lot of data produced and stored in the cloud which we can use it for the analytical purpose to process and make better decisions for future purposes. What is a node-red tool? 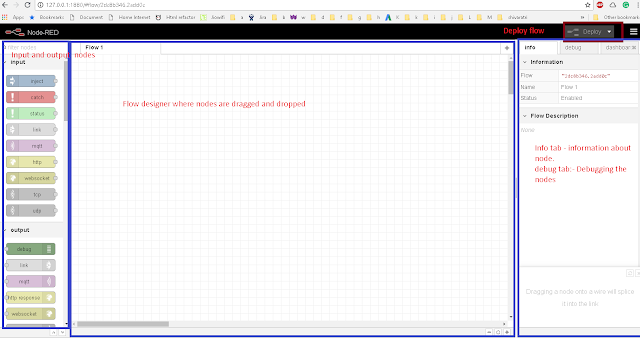 Node-red is the flow-based editor and it is an opensource application. It provides browser-based visual flow editor and it is very easy for developers/designers to wire the different nodes and services. here nodes are hardware devices This is a lightweight tool and built on the node.js framework. performance is good. To configure node-red tool, node.js installation is required. Please see steps documented at Npm and node installation. this installs node red successfully, run node-red command. this starts the node-red server on your machine and logs the below message to console. then access http://127.0.0.1:1880/ in your browser, admin UI opened. By default user login details not required. This screen has three columns. 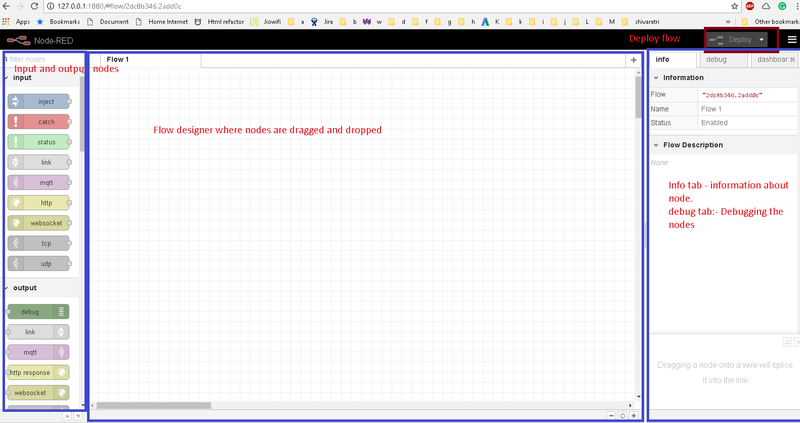 the left column has node section center column flow editor where nodes dragged, dropped and wiring using API endpoints. Top right side has an option for production deployment. Inject node is to manual triggering of a node during the scheduled interval. Time will be configured. Debug nodes are used to log the payload and object message to console. social section has nodes supports social media providers. Easily save and get the data from the database. MQTT is abbreviated as Message Queuing Telemetry Transport. This is protocol based on messaging model using publish and subscribe pattern. This is implemented on top of the HTTP protocol. This is used in Internet of things - physical devices or mobile devices to communicate the messages over this protocol with limited network bandwidth.Facebook used this protocol for their online chat messenger application. Node red provides MQTT Input node and MQTT output Node, MQTT Config node to connect to MQTT brokers to allow publish and subscribe messaging. To have pub-sub model, Need server/broker which accepted published messages and send a notification to subscribers. Nodered is flow level programming tool. I will write next articles on Learn nodered examples on using raspberry PI devices.